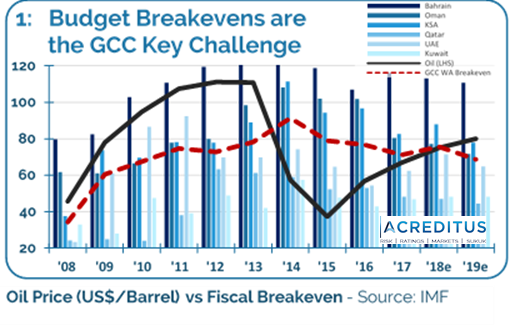 The shock of a ~$30 low-oil (Brent) exposed the fiscal in 2016 was enough to trigger a swathe of rating downgrades, with weaker names quickly hitting BB/B for S&P – currently the most conservative/pessimistic of the three CRAs in the GCC (chart 2). These actions were not just driven by short-term fiscal deficits but the new perceptions regarding the longer-term sustainability of credit profiles that are dependent on volatile hydrocarbon income and facing mounting social, economic and structural energy pressures. reduction in US FED quantitative easing (chart 1). accelerated pace of US FED rate-rises. unexpectedly high volume of UST issuances. With short-term rates likely to hit 2.25-2.5% by year-end 2018, the increased attractiveness and supply of US credit assets has prompted the first ~$6 billion EM outflow, in 18 months (30 months if we exclude the Trump election ‘spike’). As the Fed tightening continues (likely a long process given the uncertainties of QE). It should be noted that while domestic capital markets lack a deep institutional investor base – local demand is typically anchored by a GCC base of well capitalised and liquid banks… [[see full paper for full section]]. The combination of fiscal breakeven levels (associated deficits) and sovereign reserves are the two most visible, and specific credit factors driving sustainable balance sheet strength. Having wisely learnt their lessons from the past, the stronger Gulf countries had prudently banked much of the oil windfall of the 2010 to 2014 period to collectively build reserves of over $2.5 trillion as of December 2017 (chart 5). There are ongoing long-term structural reforms versus cyclical changes needed to deliver ‘bottom-line’ economic benefits that in turn should build more resilient credit profiles in the future. These credit factors are based on a subjective view on the goals, pace and progress of these reforms. Objective progress has thus far is slow with no short-cuts, non-oil GDP growth (a key progress metric) has been muted and highlights the reliance of the non-oil economy on oil-dependent public spending. Current fiscal pressures vary substantially and the subjective expectations around timing and likelihood of reform success is also driving a variation in ratings with Moody’s & Fitch typically more optimistic about the outcomes versus S&P. Political risk is a general basket for many qualitative factors ranging from rulership succession and various social pressures to the recent fracturing of the GCC ‘common’ market with Qatar and the possibilities of escalation with Iran. Furthermore, also incorporated is the relative immaturity and opacity of regional institutions and policymaking which can constrain predictability. The political risk ‘baseline’ is the region is high for a multitude of reasons, but the region has an almost inverse fiscal relationship with political risk. As it rises, optimism, investment as well as spending/consumption tends to fall, and the regional risk premium commensurately climbs. However, this climb supports higher oil prices which improves government revenues and public-sector finances. Despite ongoing reform efforts, oil will remain the key credit driver for the region over the next decade at least. Sovereign reserves should be holistically integrated into sovereign risk assessments, but the lack of transparency makes this a challenging exercise. Reform efforts are ongoing with non-oil GDP and fiscal break-evens representing a blunt measure of progress. Finally, as we have seen already, the end of ‘easy’ EM Liquidity will drive more discriminatory spreads pushing up benchmark funding costs, especially for the more pressured sovereigns. Please enjoy a short diversion from GCC credit markets in a short but wide-ranging financial podcast on the topic that should be interesting for anyone who considers that one way to help moderate rising inequality is to encourage a much more longer-term investment thinking in society more broadly. A lot of ideas – inclusive #capitalism, #equity Vs #debt, replication vs innovation, #sukuk markets, Trump, #Brexit, #inequality, #blockchain, #microfinance, quantitative easing, 2018, #oil, #GCC risk, #crowdfunding– all tied (hopefully coherently) together. Agree or disagree? Find us in LinkedIn and leave your comments..
An early Eid Mubarak to all those in the GCC and beyond. The topic of Sukuk standards is an important but sometimes divisive one in Islamic capital markets and is constant source of debate between the many key industry stakeholders. While many esteemed industry bodies like the Accounting Association of Islamic Financial Institutions (AAOIFI) and the International Islamic Financial Market (IIFM) have worked or are working on standards, adoption remains limited. The market remains fragmented and Shariah-compliance driven structural complexity can expose investors to legal risks that do not apply to conventional instruments, subduing global growth prospects and liquidity – a regulatory boost of ‘pragmatic’ standards would support better sector transparency and governance. 1 – Topic of sukuk standards remains divisive in the industry. 2 – Standard-setting Industry bodies typically have no legislative powers – only guidelines. 3 – Globally sukuk markets remain fragmented with corporate issuance more exposed to legal challenges. 4 – Standards would reduce issuance costs, improve liquidity, market transparency and growth. 5 – Motives and incentives of all market stakeholders need to be considered carefully but Issuers and Investors are the most important. 6 – Regulatory support and Central Shariah Boards are needed to promote standards and improve governance in the sector. Sukuk Standards can have multiple beneficial effects for a sukuk industry that has struggled to harmonise given the fractured nature of the Islamic capital markets and the varying incentives of the stakeholders involved. Issuers and investors in the ‘unsecured’ sukuk market could benefit from lower costs and reduced complexity leading to higher issuance volumes, transparency and liquidity. Regulatory endorsed standards could also moderate some of the legal risks generated by the (Shariah-compliance driven) structural complexity that have come to the fore in the recent and ongoing high-yield corporate distress of Dana Gas PJSC of the UAE. The recent English court ruling is favourable for investors, but local UAE onshore enforcement is still pending . Such legal complexity is not present with ‘conventional’ bond instruments but often investors seeking to access to specific credit opportunities are drawn into such instruments regardless of the investment friction involved. At Acreditus we believe that active regulatory ‘endorsement’ of pragmatic standards will boost confidence for international investors and help the sector mature. The best way to move forward is to empower investors through transparency, governance and education – having standards supports all three of these objectives that are important to build a growing sukuk market that all investors can have confidence in. The opposing Spanish and Italian approaches to resolving bank distress made for a dramatic June this year… Spain’s Banco Popular ‘bail-in’ was a textbook application of Basel 3 and EU mechanics put in place post the financial crisis to ensure zero public cost, ‘market’ solutions to bank distress. These mechanics were then ‘avoided’ three weeks later in Italy, with a €17Bn ‘bail-out’ of two Venetian banks. 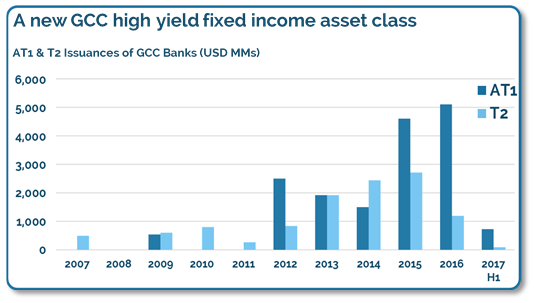 What – if any – implications do these credit events have for GCC banks? Local regulators are implementing the theory of bank bail-ins regardless of a long and non-controversial history of state-support. So what risk should subordinated bank investors be pricing in? Despite the broad implementation of Basel 3 by 2018, the supportive banking environment of the GCC is still a world away from that of Europe. 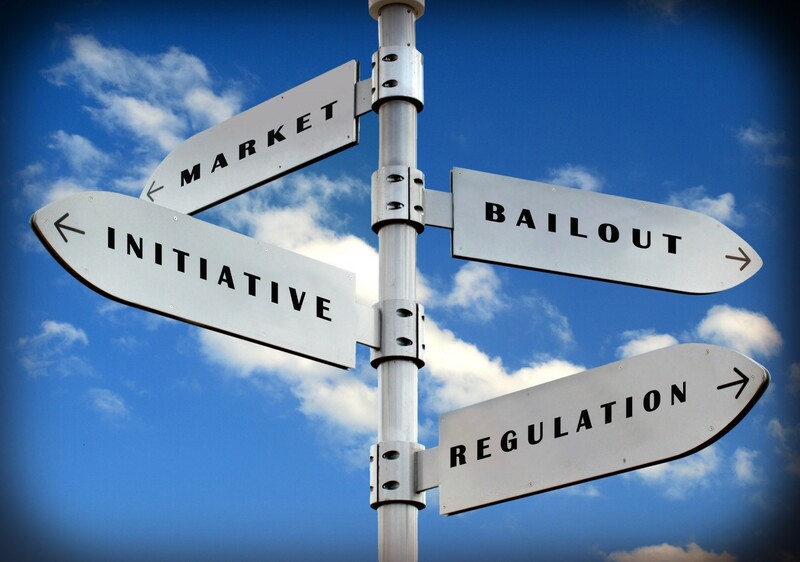 As such, there are two key drivers that would likely reduce the willingness of local regulators to trigger the discretionary (hard triggers uncommon) bail-in mechanisms incorporated into local AT1 and Tier 2 debt and thus making much of the local junior bank debt less risky than the European variety in our opinion. 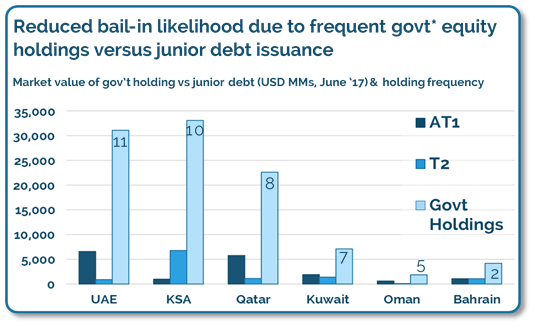 Unlike Europe and the USA, where the authorities are keen to reduce their banking stakes, GCC governments and their associated wealth and pension funds are very comfortable with sizable levels of bank ownership, some of which was acquired through past bail-outs. Much of this comfort originates from the fact that much of the oil-wealth is redeployed into new non-oil sectors via the creation of new state corporates. The banks themselves are the best means to recycle this capital into the economy in a more disciplined and risk-adjusted fashion. Of the top 50 GCC banks by assets, over 80% have some shareholding from the relevant government. In this loose definition, we include sovereign investment vehicles and wealth funds, state pension and social funds (typically wholly owned by a government agency or ministry). These equity stakes show a wide range from around 10% to 60% (median 25%) equating to ~$150mm to $15bn in absolute dollar terms (median $600mm). Basel compliant junior debt outstanding ranges from $200mm to about $2700mm (median = $300mm) per bank. It is assumed that in any bail-in situation the equity holders (like BP) would be wiped out before hitting the AT1s and then T2s that are higher in the capital structure. As a shareholder, the commercial incentive for government support is strong – based on crude average, the government would need to write-down its own $600mm equity holding to zero before recouping $300mm from bondholders. Indeed, for such banks, the point where equity value equals junior debt outstanding may prove to be step up in bail-in probability. The rationale holds true for larger debt/sukuk issuances as these banks typically have larger state shareholdings. Facing severe liquidity pressures, Dana Gas announced restructuring discussions on the 3rd May 2017 for its maturing [Sukuk] financing – a ‘normal’ event in a challenging environment. Extraordinary however, was that on the 13th June, Dana announced their Sukuk no longer ‘complied’ with Shariah principles and proposed a new ‘compliant’ but reduced value instrument. They rapidly secured injunctions against creditors to preclude enforcement. 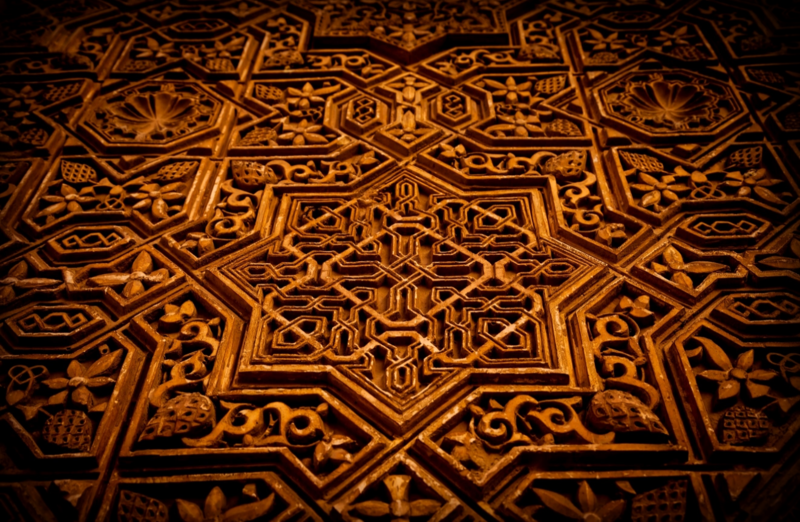 Irrespective of the ultimate court ruling, this creates investor uncertainty around the enforceability of sukuk obligations highlighting a key legal difference with conventional bonds that could drive up the risk premium associated with such instruments or worse – cause international investors to avoid the sector. Why Are Sukuk Instruments Legally Complex? FAs noted above, there exists an inherent tension between the underlying equity and asset financing principles favoured by Shariah and the current capital market needs of Sukuk issuers & investors – who seek a debt-like instrument. Thus, through complex legal structuring, existing Islamic financing structures – that ordinarily have asset-backed, profit/loss-sharing features – are re-engineered to provide the risk, return and rating profile of an unsecured bond. It should be noted that sukuk ‘profit’ payments are typically equivalent to coupon/interest payment obligations and this is what the capital market ‘wants’. 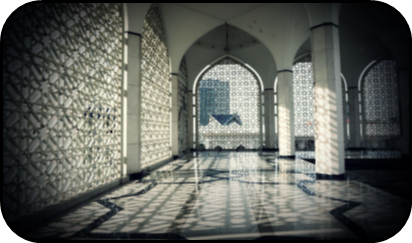 It is this tension and sukuk complexity that has provided Dana a legal opening to propose that their sukuk instrument is non-compliant with their revised Shariah investment principles. What Did Dana Do and Why? On 3 May 2017, Dana Gas sought a restructuring discussion for its outstanding US$350 million 9% ordinary certificates and its US$350 million 7% exchangeable certificates, each due October 2017. On 13 June 2017, Dana Gas in a PR stated it had receive [undisclosed] legal advice that the Sukuk in their present form were not Shariah compliant and were therefore unlawful under UAE law. As such, they would suspend the remaining payments due and incorporate them in a newly proposed Shariah ‘compliant’ instrument due 2021. The sukuk transactions are explicitly governed by English and UAE law (not Shariah law) hence Dana has been granted injunctions by courts in Sharjah, followed by England and the British Virgin Islands to avoid creditor enforcement upon what would have otherwise been a payment default. In applying this strategy Dana has so far been successful in delaying creditors unlike the acrimonious workout of 2012. Although market consensus is that the ultimate possibility of an ‘unlawful’ sukuk ruling is low, it is not insignificant and difficult to quantify. Such a judgement would render the transaction documents (and any associated security packages) unenforceable – thus weakening the creditor position for the restructuring discussions. Also any English law judgement would ultimately need to be enforced onshore in the UAE. What Is the Restructured Sukuk Proposal? 1. Profit/coupon rate less than half the current level with some proportion Payable-In-Kind. 2. Tenor of four years. 3. No conversion features (high expected value if outstanding arbtrartions are settled). 4. Prepayment facility without penalty. The economic value of the new instrument would be lower and riskier than the original and by credit. market and rating agency definitions this would be classified as a distressed exchange / default. This instrument is actually closer to the underlying equity risk sharing principles noted above, but as described below this is most likely irrelevant given the sukuk contractual documentation. There has been some commentary on the specific Islamic financing structure applied by Dana – Mudarabah, as being more exposed to such challenge versus others such as Musharakah and Ijarah etc. Investors thankfully should not concern themselves with the intricate varieties of structures available. 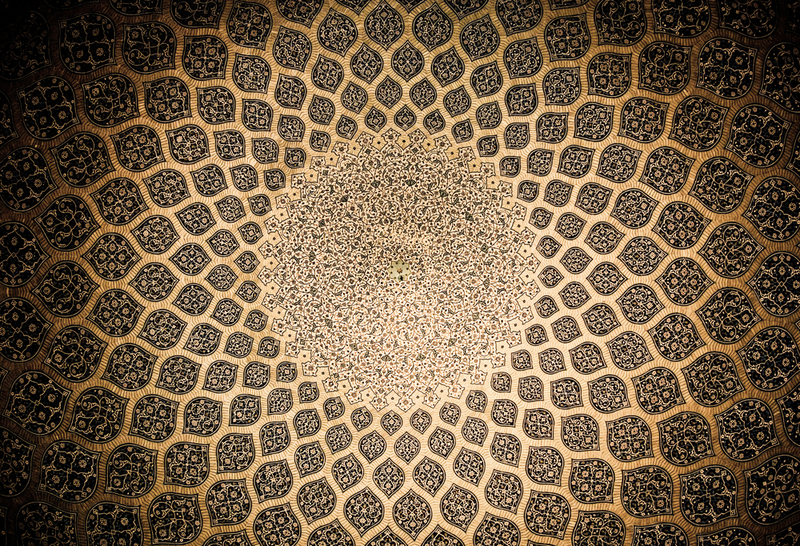 In our opinion, where some existing Islamic structures are compromised into a debt-type instrument, such structures are always exposed to a deep inspection that highlights its conventional features. Hence the need for a National Shariah Board (see below) to establish a market ‘friendly’ standard to discourage future legal challenges. Can We Rely on Sukuk Ratings? The big three credit rating agencies (CRAs) Moody’s, Fitch and Standard & Poor’s base their rating analysis on credit risk and do not opine on Shariah compliance. Indeed, they would struggle to rate issuances that had any credit risk implications contingent on Shariah considerations. While sukuk structures with variable payment or asset-backed characteristics can be sometimes be rated under the appropriate structured finance methodologies, all CRAs typically assess the likelihood of timely payment of interest/profit and principal/capital which would be difficult under true equity-like structures. Diversity of Shariah opinion is a key element of Islamic Finance and no CRA could anticipate changes in market or investor sentiment regarding orthodoxy. Instruments contractually impacted by such sentiment would likely be un-rateable. Investors can assume that where sukuk ratings are on par with the Issuer rating and/or unsecured debt there is no such contingent language but they should review the methodologies and public sukuk press releases of the relevant agency for a definitive view on a particular instrument. What Should We Do Now with Our Sukuk Investments? Investors should simply check there are no contractual obligations or events contingent on Shariah considerations. It is emphasised that presence of such language is highly unlikely in public transactions, although the author did come across one transaction (out of 50+) where annual Shariah certification was required but there were no contingent credit events. The industry will be watching the case closely given the impact on regional sukuk issuance in a jurisdiction that has actively promoted Islamic Finance at the highest levels. It has been a busy 2017 thus far for GCC sovereign ratings: UAE and Kuwait were both stabilised by Moody’s at Aa2/Stable but Qatar was downgraded to Aa3/Stable (May 23rd 2017), consistent with S&P’s recent AA outlook change to negative on the 3rd March 2017, and Fitch remains at AA/Stable. This short article provides some insights into the credit drivers of recent actions – full PRs are public on each agency website. For all of the GCC credits, despite ongoing diversification, oil prices are the key risk driver that drives a very high level of asset correlation across the region. Thus, stabilisation of oil prices in the $40-60 range is an obvious key credit positive, driving reduced fiscal deficits and even a return to modest surplus in some cases. This recovery has helped reduce the material tail risk of a sustained $30 oil prices of early 2016 and moderated the downside risk scenarios for the rating agencies. 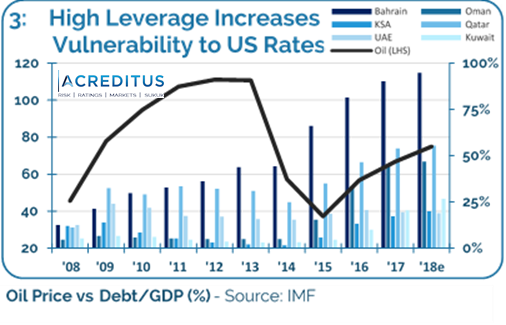 As a result of the price shock, 2016 was a breakout year for GCC credit with cheap, QE driven USD liquidity compressing GCC spreads – overriding the impact of the region’s weakening fiscal and economic fundamentals. This has helped fund over $70Bn of debt/sukuk, with each issuance oversubscribed multiple times and often pricing tighter than guidance. Despite the recent volumes however, bank financing continues to dominate and the absence of local capital markets (and much needed institutional investors) continues to reduce the resilience of economies to shocks and changes in external risk perception of the region. 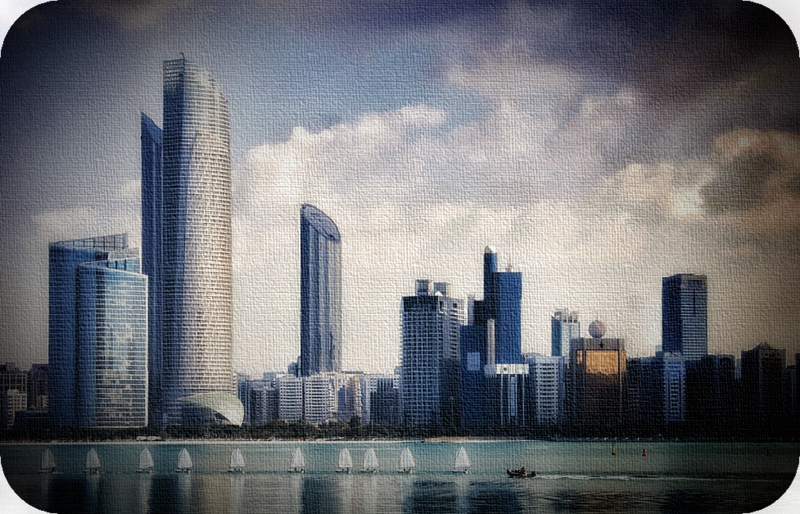 Kuwait, UAE & Qatar – Three Of A Kind? In the case of Kuwait (Aa2/Stable, AA/Stable, AA/Stable) the slower pace (and perhaps need) of reform is broadly offset by an incredible balance sheet (KIA assets estimated at 550%/GDP ~$600bn) with govt debt trending to ~35%/GDP. Public spending in the country has continually lagged its peers so the improved pipeline of projects should provide improved growth opportunities going forward. The UAE/Abu Dhabi* (Aa2/Stable, AA/Stable*, AA/Stable*) balance sheet is also strong (ADIA assets estimated at 155%/GDP ~$580Bn) with UAE debt/GDP trending towards ~20% (Dubai’s debt is a component of Moody’s UAE rating). A key stabilisation driver has been the effectiveness of policy responses thus far, market engagement and corporate rationalisation efforts. The economic diversity of the country is also key and all these positive trends – amongst the strongest in the region – look set to continue. 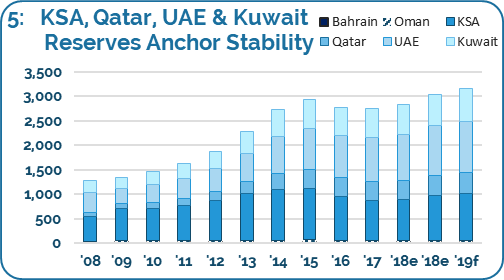 For Qatar, (Aa3/Stable, AA/Neg, AA/stable) despite sizable QIA reserves (estimated at 200%/GDP ~$300Bn), it has regularly tapped the market to leverage its strong credit profile. This (likely) helps improve the overall returns/profitability and diversification of the sovereign balance sheet. As such, govt Debt/GDP looks set to trend to the 50% level. Nonetheless, despite the downgrades, international investor appetite for GCC credit remains strong and Qatar’s is still a AA/Aa credit for all agencies which puts them amongst the highest rated sovereigns globally. REPORT: Trump & Brexit Events Highlight the Need for More Participation (Islamic) Finance. The new report published by Acreditus proposes that after decades of increasing financial inequality and insecurity, the majority of citizens in the USA and UK have expressed their desire for change via the election of Trump and the Brexit referendum. 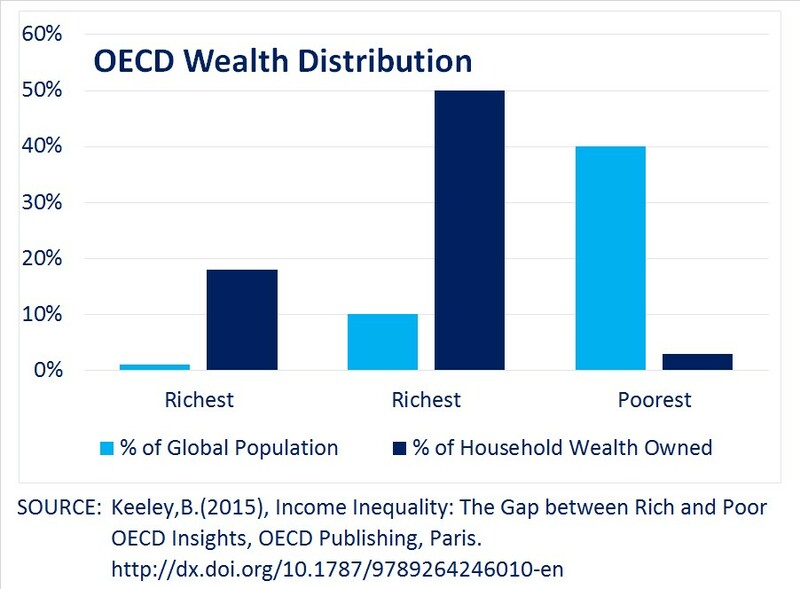 This portion of the population has been broadly excluded from substantial wealth creation of recent decades that has been largely driven by globalisation, financialisation and technology. ‘Islamic Finance’ – also known by the more descriptive and inclusive name of ‘Participation Finance’ simplistically discourages debt based income and hence broadly favours equity and productive asset investment instead of unsecured lending for consumption and speculation. As such it represents an ‘old’ form of inclusive capitalism. The report proposes that a more widespread application of Participation/Islamic Finance principles would support a more inclusive versus neoliberal approach to capitalism and help reduce the inequality that is a key factor driving increased protectionism and social intolerance. “The top 10% of people globally control 50% of household wealth in OECD countries, the bottom 40% have only 3% and the USA scores particularly poorly for equality with a surprisingly high level of poverty” says Khalid Howladar – Managing Director and Founder of Acreditus – a new GCC risk, rating and Islamic finance focused consultancy. Khalid was formerly Global Head of Islamic Finance at Moody’s Investor’s Service and the Senior Vice President/Team Leader of the GCC Banking team. “Both the UK and USA saw a worrying increase – from 2% to over 70% – over the last decade, of households whose incomes declined or remained flat” he adds. These metrics are derived from comprehensive studies undertaken by the Organisation for Economic Co-operation and Development (OECD) and the McKinsey Global Institute in 2016 show a very real and rising trend in inequality and highlight the need for more equitable and inclusive forms of capitalism. “Current economic policies often encourage an endless cycle of debt-based consumption and leverage as a path to prosperity, an approach that caused the Global Financial Crisis which hurt the weakest in society” notes Howladar. “Participation finance discourages such consumption-driven lending in favour of equity and tangible assets, where most of the wealth creation of the last decades has accumulated’ he says. The lack of economic diversification coupled with public sector dominance of the economy has meant a low-oil driven economic slowdown and systemic liquidity pressures across the GCC since 2015. Government budgets remain stretched at a time of heightened regional political risk compounded by social and youth demographic pressures. Despite the recent rise in the oil prices following OPEC’s production cuts in November 2016, Acreditus expects that US Shale will continue to have a suppressive effect at the $60 level for the foreseeable future given the continually falling cost of technology, flexibility and responsiveness of producers and now the high likelihood of increasing deregulation and loosened environmental restrictions under the Trump administration. In GCC banking, Acreditus expects some regulatory forbearance, an increasing amount of restructured exposures and climbing non-performing loans. While such an environment would seem ripe to see further consolidation (FGB/NBAD, Masraf Al Rayan) most systems will continue to remain over-banked and merger/acquisition activity will remain an economic as well a state-driven affair given high level of government shareholdings. Commentary on SAR depeg is persistent but Acreditus believes such a move would add further intense uncertainty at an already volatile time. As such, is unlikely for the next 12 months. Overall, regional Confidence sensitivity remains high but overall GCC banks are far better prepared that 2007/2008 with robust capital levels and sound albeit declining liquidity buffers. Please note, the research below was written while the author/co-author/contributor was employed at Moody’s Investors’ Service. The links below lead to the public summary and relevant download instructions which may be for Moody’s subscribers only or require purchase. Despite slowing, Islamic banking continues to outpace growth in conventional banking in key markets – sometimes by up to 50%, often due to proactive government regulations and strong retail customer demand. Oman was a particularly strong newcomer with sector penetration rising from zero to 10% of banking system assets within four short years. However, historical growth lags in key markets like Turkey and Indonesia, which Acreditus believes are only now beginning to explore their immense potential. 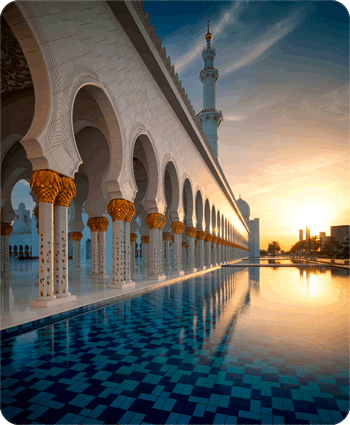 Broader slowdown reflects more challenging economic conditions in the core Islamic markets of the GCC due to low oil price related confidence, asset quality and liquidity pressures. Malaysia and Indonesia remain highly supportive of the Islamic industry with sukuk taking a steadily increasing share of issuance. 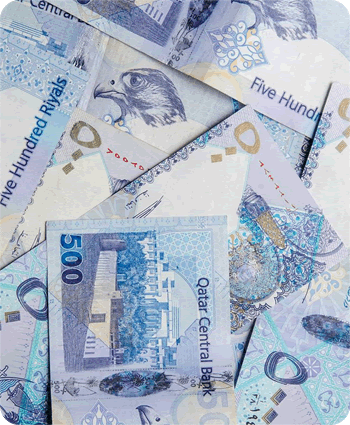 Despite large Islamic banking sectors and high sukuk demand, GCC governments issued a record ~$30 billion of conventional bonds in 2016, neglecting sukuk given the US and European focus of the sales and the desire to avoid further exacerbating the liquidity pressures in the home markets although Acreditus believes the sukuk market will be boosted by GCC entrants in 2017. The lack on of Shariah compliant liquidity management instruments continues to remain a challenge for GCC IFIs – particularly with the new Basel III liquidity requirements. Acreditus believes supranational cooperation efforts – like the International Islamic Liquidity Management Corp. – have a critical role to play in this respect.